A Canadian ship's effort to breach Israel's naval blockade of Gaza was quashed when Israeli forces boarded the vessel Friday, but activists say the setback won't discourage them from trying again. The Tahrir, which made a previous failed attempt to reach the blockaded Palestinian territory this summer, was intercepted two days after it left Turkey for Gaza. A Montreal organizer for the Canadian Boat to Gaza said the takeover of the vessel carrying medical aid and activists from nine countries was not the end of attempts to draw attention to a five-year-old blockade of the impoverished coastal strip. "Our goal is quite clear, it's to bring humanitarian aid and hope to the Palestinians of Gaza," said Canadian Boat to Gaza spokesman Denis Kosseim. "We're going to keep coming back, you can take that to the bank." Three Canadians, Montrealer Ehab Lotayef, Torontonian Karen DeVito and David Heap from London, Ont., were aboard the Tahrir, but couldn't be reached for interviews Friday. "There was some sort of a black-out," said Kosseim. My speculation is that when the Israelis boarded the ship they cut off communications." Israel said its navy peacefully boarded two protest vessels on Friday — the Tahrir and an Irish ship — and towed them to the Israeli port of Ashdod, just north of the Palestinian territory. Officials said the troops took action after repeated calls for the vessels to turn around were ignored. Canadian activists said those calls from the military were heard. When asked over the radio by approaching Israeli boats what their destination was, Lotayef reportedly said "the conscience of humanity" and when asked again, he replied saying the ship's final destination was "the betterment of mankind." Israel has said its naval blockade of Gaza, imposed in 2007, is vital to stop weapons reaching the Iran-backed Hamas militants who control the territory. Critics say it amounts to collective punishment. Israel sees the attempts to break the sea blockade as provocations and publicity stunts. It said the amount of aid in the small boats used by activists is insignificant, as Israel transfers aid to Gaza daily. "The way we see it, we're not provoking Israel. Israel is provoking through its inhuman and illegal blockade of Gaza a reaction by civil society in Canada," said Kosseim. "We can't just stand quiet. We are, in a non-violent manner, defying the blockade." 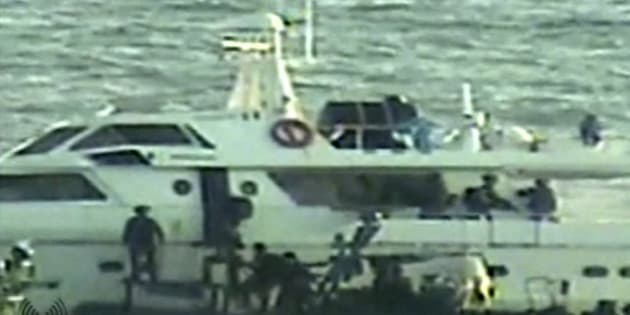 The Israeli military issued a short video clip showing a naval official calling on the ships to turn around after warning them the region was closed to maritime traffic. A vessel was also sprayed briefly with a water cannon. Israeli police have said those aboard the two intercepted ships will be questioned by police and immigration officials and then sent back to their home countries as soon as possible. Ottawa has warned Canadians against all travel to Gaza, saying the security situation along the coast remains volatile. Foreign Affairs Minister John Baird has also said Canada can't protect Canadians who break the laws of another country. He urged those wishing to deliver aid to do so through "established channels." "Unauthorized efforts to deliver aid are provocative and, ultimately, unhelpful to the people of Gaza," he had said in a statement. Baird also recognized Israel’s right to protect itself and its people from attacks by Hamas and other terrorist groups, including by preventing the smuggling of weapons.